Derek Jeter hung up his glove last September, ending a legendary 20-season baseball career with the Yankees. He's since embarked on a new path: publisher of The Players' Tribune, a portal for athletes to share their thoughts and experiences. We spoke to The Captain about the motivations for creating his new outlet, why video is important to the publication, what to expect from it and why he's happy staying off-camera in this new venture. 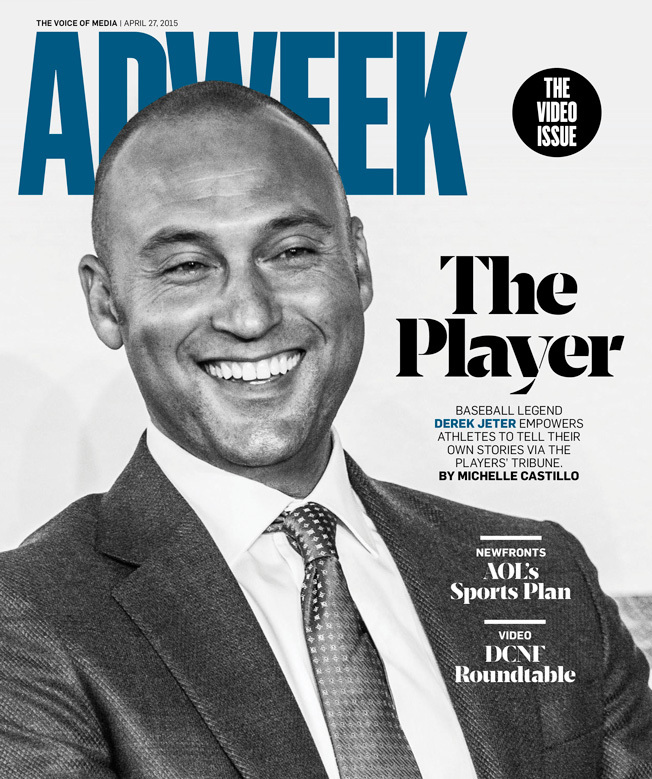 Adweek: Why start The Players' Tribune? Derek Jeter: I'm still expanding the things I want to do in this part of my life. As someone who's been a focus of the media during my career, and has thought about it quite a bit, I definitely saw the need for something like The Players' Tribune. I had to deal with the media on a daily basis: when I first showed up to the game, during batting practice, after the game. I was constantly asked questions. I constantly answered questions. I think a lot of times—not speaking from my own experience, but speaking to a lot of athletes from different sports—athletes may be a little hesitant to share their entire opinions. They're scared about how things can be misconstrued at times. I felt as though this is something that was needed. Judging by all the contributions we've got from different athletes, I think a lot of people are in agreement. When you started, social media wasn't around. How has it changed how athletes communicate with the public and press? (Laughs) Is that a way to say that I'm old? It's changed the landscape of reporting and what you do. Like watching a game, now you can't even tape a game because it would be hard to avoid all the social media and people giving you updates. You have to watch in real time. In terms of what athletes do on the field and on the court, everything they do seems instantaneously found out by everyone. You go to a restaurant, everyone knows. You go to a movie, everyone knows. I think that's changed the landscape on the field of play, but off the field as well. Everyone is a reporter now. How have online publications changed sports reporting? People are always fighting for stories. They're fighting for headlines. I think people always want to get the story out first, not always right. Then they check the story and the facts later on, which is unfortunate. I'm not saying everyone, but I think at times that happens. We wanted a place where athletes can get the story out and tell their opinions first off. Other platforms have different priorities, like the news cycle or game coverage. That's just not us. Sometimes people are interested in creating headlines, and I think that affects how stories are written at times. We want the story to be right. This is a way for [athletes] to tell their story from their point of view, unfiltered. We wanted the place to be comfortable, where they can speak their mind and not worry about things being taken out of context and not worry about only part of the story getting out. When I retired, I posted a letter on my foundation's [Turn 2 Foundation] Facebook page because I wanted everyone to see the entire message if they wanted to. Do athletes actually write the stories for The Players' Tribune? Some athletes write the stories, and some athletes work with our producers who then ghostwrite the stories for them. In that case, our producers create a transcript from their conversations, and from there a story is written. Usually it goes back and forth a few times between the producers and the athletes, and nothing goes up without final athlete approval.